There is a great competition on YouTube platform as there are many vloggers producing the video content on same topics. To grab the attention of the audience and to keep them hooked to the video until the end, the video needs to have good quality audio and video. Good lighting is important to create YouTube videos. It is not likely that we get the natural light all the time. Investing in good lighting equipment is necessary if you are going to record your videos in the house. This gives a soft white look to the video. It comes with 5/8” flexible mount, 18-inch diameter and 65watt power. This can be placed on any light stand. This is perfect for the YouTuber for their on camera needs. This is especially suitable to be used by fashion and beauty vloggers. Those who want a small set up can use this. The light comes along with mounting hardware two lamps of 3299 k and 5500 K, AC power cord and a carry case. This is a fluorescent ring light of 18 inches. This is opted for the YouTube videographers to have daylight balanced lighting. The lights can be dimmed if low light is required. The Prismatic Diffusion plates help evenly distribute the light and eliminate shadows to give professional quality videos. And the things you get with this purchase are the 60 Hz ring light, 5000K daylight bulb and others. This is the easier way to light larger spaces. This is most suitable for YouTube vloggers who are generally on a budget. They can get more worth for the money they spend. This comes with two backdrop support stands, 2000 watt softbox lighting kit and hairlight, light stands, bulbs and boom, one 16 X 16 inches softbox and 105 watts CFL bulb. The buyers can also get three muslin backdrops in three different colors. This is another great choice of lighting equipment for the YouTube videos. This can be used indoors to record YouTube videos. The 5 daylight CFL bulbs, overhead boomlight and a large daylight CFL build give a good quality suitable. The clean light that the kit produces can make the videos really look great. These can be used to shoot videos in other locations also. The lights in the soft boxes can be controlled individually and this is one of the interesting features. Some of the parts in the kit are made with plastic but not bad for the price these are offered. This kit comes with three softbox lights that stand six inches tall, 3 light heads that can hold four bulbs each, fluorescent bulbs and carry case. This is suitable for the bloggers who want a white background. As this comes for an affordable price, it can be a great starter kit for the vloggers. The lighting it gives is bright and cool. Hair light is also included in the kit. Offered for those on a tight budget, many of the YouTubers are using this to get good results. The kit comes with a deluxe carrying case and the whole kit can be fit into this one bag. Great lighting is essential for YouTube videos. 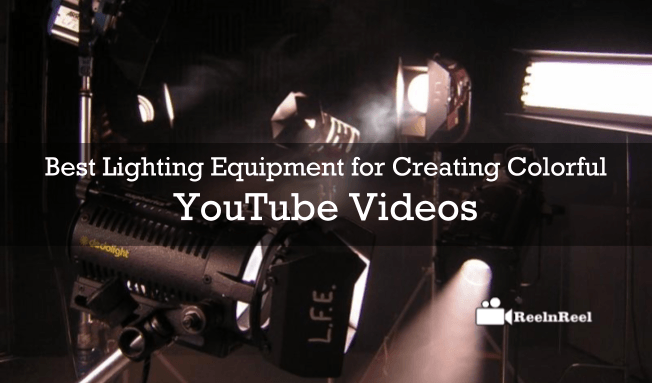 A wide range of lighting equipment are available in the market today and using these you can make professional standard videos for your YouTube channels. Choose the best one based on your budget and the type of video you are creating.